Caroline Symcox finally gets the opportunity to write her own story for Big Finish after previously co-authoring ‘Seasons of Fear’ with Paul Cornell. The result is ‘The Council of Nicaea,’ a fascinating tale that explores the history of the church extensively. Theology is used very well throughout, and it is from factions with disparate theological viewpoints that the danger to the Doctor and his companion arises. The concept of Christ’s divinity becomes the focal point, a discussion important enough for the Emperor himself to become involved in at the titular Council and a topic much more meaningful to Erimem who comes from a religiously-centred society. In fact, there is an innate air of dissent about the TARDIS crew throughout the story, starting from the beginning as Erimem expresses interest in events and being relatively close to home whereas Peri can only think about the poor local facilities and conditions sure to meet them. Shockingly, though, it’s Erimem who starts causing much more trouble as events progress, especially once she discovers that Arius will not be given the opportunity to defend his beliefs at the Council while facing persecution. This brings her into a conflicting position with the Doctor and Peri as she decides to help Arius despite the Doctor warning her that she cannot change history because the outcome of the Council is already known. Through this premise, Erimem very much steps into the spotlight, and the script effectively exploits the fact that Erimem’s time in the TARDIS ends is unknown. Caroline Morris again gives a masterfully passionate performance, tempted to change history by altering the influence of the Church in its fledgling state. Although she does eventually come to see the viewpoints of others, it’s fascinating to follow her journey throughout this story as she initially expresses intense fury at the Doctor for just being willing to stand by and observe as well as at Peri for just being a puppet of the Doctor’s. The Doctor is thus put into a difficult position, caught between companions and then unwillingly accepting to stay and support Erimem’s cause in a logical and subtle manner. Peter Davison is superb as always and he gets to channel a seldom seen side of his character as he angrily yells at Erimem for speaking out in Council and putting them all at risk. For a man who so constantly preaches nonintervention, his stance is called into question quite often in this story to great effect. Peri, though, also plays an important role in this story, even if it is more understated than her friends’. She sympathizes with Erimem’s desire to see justice done and Arius’s situation in general, but she also holds a steadfast belief in the Doctor when he tells her that Erimem is a risk for changing the future for the worse. She keeps her mind and, for the most part, emotions in check while straddling the line between both viewpoints, and her earnest and well-thought discussion with Erimem is undoubtedly instrumental in bringing about the rather peaceful demonstration and resolution that Constantine notices and appreciates. The supporting characters are very much relegated to supporting roles just because of how much focus is put on the regulars here. Still, David Bamber’s Constantine is electric, and the pragmatism and gravitas that he exudes is stellar. He effectively exhibits the weight of being Emperor and the internal struggle he has of suppressing his temper and emotion, nearly killing the Doctor when Erimem calls him a hypocrite. Though not as powerful, Arius as portrayed by Steve Kynman is also worthy of note. 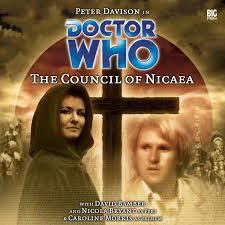 The Doctor does not fail to mention the brutality that awaits these people over the next few years after the Council meets, and ‘The Council of Nicaea’ effectively evokes the uncertain and dangerous aura of the time and proves again that the pure historical adventure has plenty of life in it yet.